In the pursuit of getting more sales and increasing revenue, one person is all too often forgotten along the way. The most important person of all – The Customer. Know our customer and we’re well on our way to bumping up that bottom line. 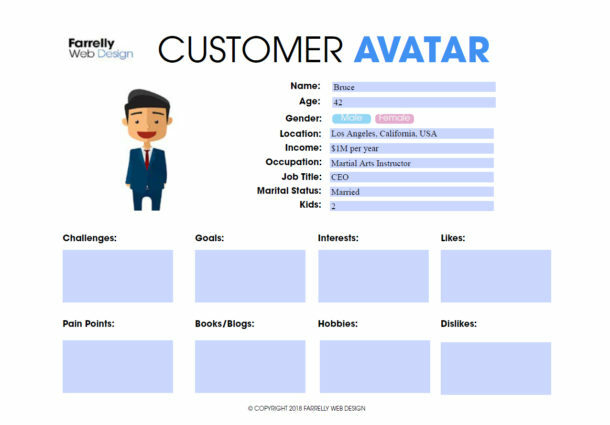 We’ve even designed a powerful, beautiful and FREE Customer Avatar Builder to help you! Connecting with the Customers we already have can help us work out the type of customers we should be trying to target. The obvious solution is to create a Survey or Questionnaire and send it out to our customers, or contact them directly. This is known as Primary Market Research. The Pareto Principle, also known as the 80/20 rule states that 20% of an input variable provides 80% of our results. Using this principle, we can determine that 80% of our revenue is generated by 20% of our customers. This also means that the “bottom” 20% of our customers are taking up 80% of our valuable time (and providing 80% of our headaches). Connecting with the top 20% will help to identify our ideal customer base. Comparing this segment with the bottom 20% provides valuable insight into the types of customers we would rather be avoiding. What we need to know about our Customers. To really know our customer, we need to get inside their mindset and figure out what makes them tick. Put ourselves in their shoes and discover the power of empathy. When we empathise with our customers, we are relating to them. This is the very foundation of a relationship. So what should we be asking our top 20% of customers? Challenges – What are the problems our customers need help solving? Goals – What would our ideal customer like to achieve the most? Demographics – Age, gender, income, location, marital status etc. don’t they like? Do they read books, watch TV, go to the gym? This information allows us to identify who our customers are, the challenges they face and how we can help them. and how we can help them. Last year I was invited to a meeting of Tourism operators and Business Owners. There was a table dedicated to Digital Marketing, which felt like the most natural place for me to sit. When I suggested building a Customer Avatar, they (Digital Experts included) looked at me like I was from another planet. And I guess at surface level it may seem a little unordinary. But the more you think about it, the more sense it makes. Wait, what is a Customer Avatar? A customer avatar (also known as a Buyer Persona) is a virtual identity we build using the information gathered from the research data we have collected (Challenges, Goals, Demographics, Interests etc.). We’re basically taking real data and applying it to an imaginary character. This imaginary character is no joke. It’s our new ideal customer. Give them a name, hair, eyes, complexion. Breathe life into this Avatar and talk directly to them when we build our Advertising and Marketing Campaigns. Negative Avatars are also a good idea. This involves creating a persona that is built using the data from our bottom 20%. You know, the not-ideal, P.I.T.A. customers. By building a negative avatar we have a better idea who to exclude from our targeting. If our products or services appeal to a highly diverse range of customers, it’s advisable to create a number of personas and group them accordingly. By doing this, we can create a number of individualised campaigns and connect directly with each customer. While every industry is unique, many customer traits can be universally applied when building Avatars. Whether you sell shoes or plumbing services, getting the answers to some basic questions is the first step in knowing your customer. Knowing our Customer is perhaps the most crucial step of any Advertising or Marketing Campaign. As well as a foundation for our Advertising strategy, this information can be used to develop healthier Customer relationships and improve our products and services.